We work with organizations to create or improve strategic initiatives, programs and systems. Measurable impact is behind all activity in which we engage. The “En” part of the name comes from the Japanese word 「縁」. It has a few related meanings: chance encounter, fate, bonds, relationship, and connection. In English, the prefix, “En” has a meaning “to cause to be in” the condition or “to effectuate” when combined with the other words such as: Enact, Entrust, Enrich, and Encourage. So, we created the word “EnConnect” to mean “causing to be in connection” as our company name. Entire ownership shares of EnConnect Holdings, LLC has been acquired by Future Venture Capital Co., Ltd. and operates as FVC Americas. 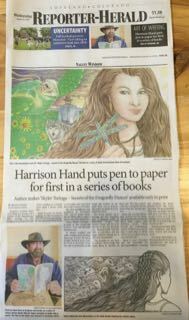 Our friend, Harrison Hand was featured in a newspaper article. Harrison has developed very innovative marketing channel development method. Contact us or Harrison for the details. Biz Girls CEO Accelerator Program starts in Fort Collins. Otsuga represented RVC to form a collaboration with Future Venture Capital, Co. Ltd., a publicly traded Venture Capital firm in Japan. EnConnect Holdings' Otsuga is now also serving as the Director of Venture Community Development with Rockies Venture Club. In collaboration with Rockies Venture Club and Biz Girls, EnConnect Holdings was awarded $15,000 and $2,000 in Cluster Grant respectively for activities to increase entrepreneurship activities in Fort Collins. Otsuga was appointed as the Komon (Corporate Advisor) to Shikoku Technology Licensing Office (TLO), technology commercialization entity for the consortium of five national universities in the Shikoku island of Japan. To learn about Komon, click here. Hope Hartman is appointed as the Executive Director of Biz Girls, a 501(c)3, non-profit group promoting high schools age girls to develop leadership skills. Otsuga was appointed as an Proof of Concept Program Advisor to Okinawa Institute of Science and Technology in Okinawa, Japan.